Peripheral artery disease is also called as peripheral vascular disease. Peripheral vascular disease is a condition where the narrowed arteries decrease blood flow to the limbs. Peripheral artery disease is also called as peripheral vascular disease. Peripheral vascular disease is a condition where the narrowed arteries decrease blood flow to the limbs.Peripheral artery disease mainly affects the legs as there is not sufficient supply of blood to the legs. Patient suffering from peripheral artery disease mostly experience leg pain. Peripheral vascular disease is an indication of accumulation of fatty deposits in the arteries. The deposition of fats in the arteries is a condition that is referred to as atherosclerosis.Ã‚Â Due to fat accumulation in the arteries the blood flow is reduced to heart, brain and legs. One frequent complaints in this diseases is claudication. Claudication is a condition where the patient experience cramping pain in legs which is induced by exercise. The pain is observed due to obstruction of arteries in the legs and is seen mostly in patients with peripheral artery disease.Claudication symptoms vary from mild to chronic pain. In severe conditions the patients finds difficulty in performing any physical activity. Peripheral vascular disease is caused due to atherosclerosis. 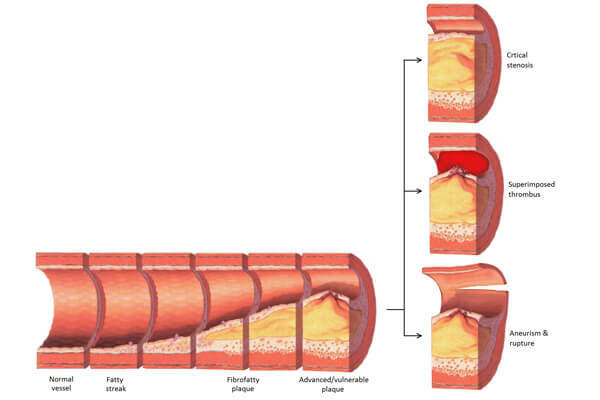 Atherosclerosis is a condition where there is gradual increase of fats accumulation inside the arteries. The fats accumulated in the arteries mixes with the calcium and other substances and become hardened by forming plaques of arteriosclerosis. The plaques formed weaken the vessel wall by narrowing and blocking it. In such cases of blockage and narrowing the arteries completely or partially restrict the blood flow through the arteries. Blood clots can also lead to blockage of blood vessels. Blood clots also lead to many other health problems ranging from mild to chronic. Diabetes is one of the major risk factor that can also lead to peripheral vascular disease. The high blood sugar level in the body can narrow and weaken the blood vessels. In few cases high blood sugar level can lead to partial or complete damage of the blood vessels. Inflammation of arteries is also referred to arteritis that can also lead to narrowing and weakening of the vessels and thus restricts the blood flow. Autoimmune conditions can also result in inflammation of blood vessels. The inflammation of vessels is also called as vasculitis. Peripheral vascular disease is generally treated by using stents. Stent is a tiny metal tube that is inserted in the blood vessel to re-establish blood flow. Ã‚Â Vascular stenting is a minimal invasive treatment that does not require surgery and invasive therapies. Stenting is also referred to as first-line treatment for peripheral vascular diseases. No surgery required. Hence less risk to patient and no scars. Dr. Abhilash Sandhyala is one of the best endovascular surgeon in Hyderabad who is specialized in treating peripheral vascular diseases. People with endovascular diseases generally consult Dr Abhilash endovascular surgeon in Hyderabad for treatment.